When the records are not there for a certain individual you are researching, one suggestion is to look into other people in the family including siblings, aunts and uncles, in-laws, etc. I admit that when I began doing genealogy I did not fully comprehend how looking at someone other than the research subject would help with my research efforts. However, the case of Laura Smith Kingsley lit up the imaginary light bulb over my head and helped to illustrate situations such as these. The case involved a man named Benajah Lester Kingsley of Becket, Berkshire County, Massachusetts. My client knew that Benajah (who also went by his middle name) married a woman named Laura Smith. The goal of the case was to determine her parents and go back on her family line. Certain that this would be easy enough, I searched for a marriage record but to no avail. It would have cracked the case if I could find a marriage document that contained the names of the parents of Laura Smith, or even a place of origin for her to research. Of course, this did not happen. All I knew was that Benajah married a Laura Smith. 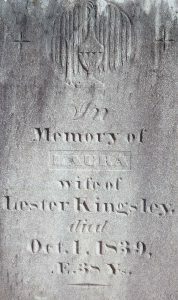 I searched for a death record for Laura, wife of Benajah Lester Kingsley, and found death and cemetery records for her. 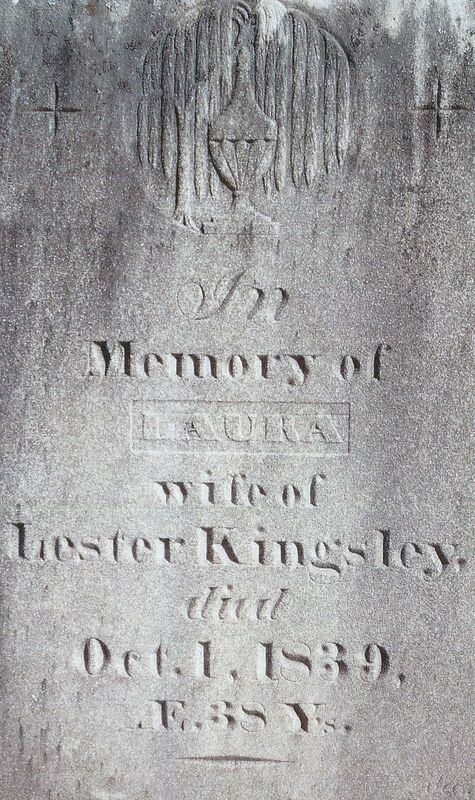 These indicated that Laura died in 1839 at the age of 38, giving her a year of birth of 1801. Next, I looked at the NEHGS database, Massachusetts: Vital Records, 1620-1850. I searched for Laura Smith, born in Berkshire County, Massachusetts, around the year 1801. Two results came up: one Laura Smith born in Becket in 1806 and another born in a town called Sandisfield, about 30 miles south of Becket. Two very plausible options for the wife of Benajah, one born in the same town as him but with a different date of birth, and another with the right date of birth but somewhat far away from Benajah. While dates of birth in historical documents can have a tendency to be off a few years, I felt that having a five-year difference in the date of birth was a little too off. Therefore, I decided to set my sights on the Laura Smith born in Sandisfield in 1801 as a possible wife for Benajah. While dates of birth in historical documents can have a tendency to be off a few years, I felt that having a five-year difference in the date of birth was a little too off. Laura’s birth record indicated that she was the daughter of Solomon Smith and Lucy Paine. I searched for a probate record for Solomon Smith of Sandisfield to see if his will mentioned a daughter Laura Kingsley or a son-in-law Benajah/Lester Kingsley, but this search revealed that Solomon died in 1807 when Laura was only six years old. This ruled out the possibility of finding any documentation from Solomon that might mention his daughter’s married name. This probate record did indicate that Laura and her brothers Alanson, Solomon (Jr.), and William were placed under the guardianship of their mother Lucy Smith after Solomon’s death. I searched The Shepard Collection in the NEHGS library for the family of Solomon Smith of Sandisfield and found that Lucy Smith was remarried to a man named Stewart Lester of Becket, the same town where Benajah Lester Kingsley was born and raised! U.S. census records showed that Stewart Lester was a neighbor of Joseph Kingsley, father of Benajah. (Cue the lightbulb!) From 1800 to 1810 Stewart Lester’s household grew by 5 people, adding three young men, a young woman, and a middle-aged female to his circle. Berkshire County land records also suggest a connection between the Lester, Smith, and Kingsley families. Land records for Benajah L. Kingsley show that he bought land from Stewart Lester’s brother John. Not only was this John Lester involved in land transactions with Benajah Kingsley and Stewart Lester, but he is also found selling land to Laura’s brothers Alanson Smith and Solomon Smith. In addition, Laura’s other brother William Smith sold land to Benajah L. Kingsley. While the relationships to one another are not directly stated in these deeds, they serve as evidence that the Lesters, Kingsleys, and Smiths had close associations with each other, further solidifying the link between these families. While there is still no documentation explicitly stating that Benajah Lester Kingsley married Laura Smith, the daughter of Solomon Smith of Sandisfield, my research has uncovered various pieces of circumstantial evidence that the family of Solomon Smith was associated with the Kingsleys of Becket, indicating that it was most likely Laura Smith, daughter of Solomon, who married Benajah Lester Kingsley. Researching documents for Laura’s mother and her second husband and noting who their neighbors were was a big break in the case and my understanding of the benefits of cluster research. 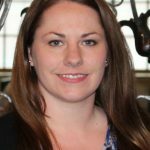 As it turns out, this Laura Smith was a Mayflower descendant of both Thomas Rogers and Stephen Hopkins, which adds more pressure to prove her lineage. However, when the records are not there sometimes all we can do is gather up all the evidence we can to argue our case. Five years off may or may not be a lot in Massachusetts records but I can assure you that it is not at all rare in New York City Irish records in the 19c–and I’d bet in other places and among other nationalities as well. I have seen up to fifteen years off tho that is rare. Almost always younger but occasionally older. I have seen first names changed–vast numbers of females named Mary became Marie, Ellen became Helen but sometimes a totally different first name was chosen. Spellings of last names often varied or were Anglicized. And later in life some born in Europe changed their place of birth to the US on the census, especially if they arrived at a young age. Finding the truth is a challenge but endlessly interesting. Well done! I will follow your advice and hope for success. Your research seems to provide strong circumstantial evidence. But if you can’t find positive proof that you’ve found the right Laura, you can also try to eliminate the other Laura from consideration, i.e., that the other Laura Smith b. 1806 is NOT the one who married Benajah Lester Kingsley. If you can show that this Laura had a full life with someone else, or somewhere else, that would further strengthen your case. Good advice, I thought the same thing. Eliminate the competition to strengthen your case. Definitely good advice. Proving that someone is Not the correct person in question, is as important as trying to prove that they are. Same name, similar birth year, even the same town can be hard to figure out, and it is very common in my experience. FFN (family, friend, and neighbor) research is a must, especially for a name like ‘Smith.’ Some of my ancestral families traveled together with other families for centuries, and I’ve been able to find my people through studying the group migration from and to certain towns. One or two families would discover an area, then summon the rest to move there too. If you think about it, it makes sense. There was safety in numbers and in those early years, they all depended on each other for survival. It seems to me that immigrant groups are still doing the same—-you go where you know someone. Great circumstantial evidence. I love that you searched the land records and found legal ties with all three families. It certainly validates suspicions, however without documented proof of a connection that’s all it is, suspicions. It doesn’t help that her last name is Smith (a name which is sure to bring vast amounts of confusion with it). You might consider focusing your research on the obits of the three brothers and mother. I have found that obits can be a rich source of family relationships. With any luck, one of her brother’s obit mentions her married name (or early death—e.g., “the late Mrs Kingsley” ). This would be a substantial documented connection. In some ethnic groups like Italian Americans and French Canadians, and quite a lot in early New England, the parents will name their child the same name of a recently deceased sibling in the family. So, just because The age might be a little off, does not necessarily mean you got the wrong family. You may have just come across the birthdate of the sibling of the same name who died young. Interesting post based on Wednesday’s main post on Mayflower ancestors activity. Yesterday In reviewing my tree information I noted similar Kingsley name information. Do you show that Benajah/Lester is also a Mayflower descendant from the Billingtons through Amos Kingsley 1696? A friend ran into the same issue (no marriage record for one pair of direct ancestors) while applying for Mayflower Society membership. It was the last link in the chain of proof she needed. Despite the lack the lack of an actual marriage rec, many other sources similar to those you cited in this article were sufficient “proof” that the couple were indeed legally married and my friend’s app was approved.